The Taste of the Silk Road rail adventure offers travelers unparalleled access to places few Westerners have ventured, and is one of the most exotic and best-loved by Society of IRT members. 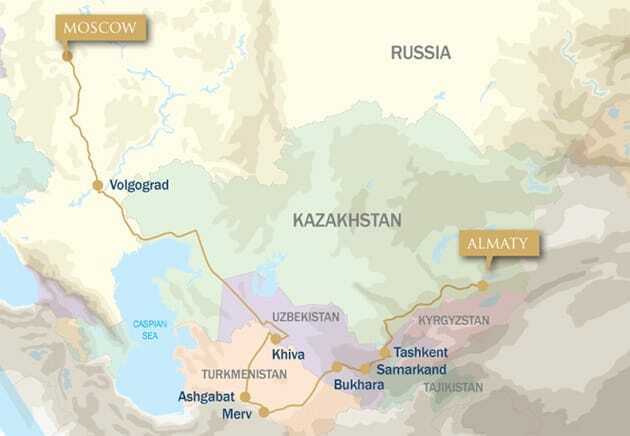 This abbreviated version of the journey allows you to visit the storied sites of Kazakhstan, Uzbekistan, Turkmenistan and Russia in only 13 days. For the classic 21-day Silk Road journey, please visit our website here. The luxurious Golden Eagle will transport you back in time. Follow in the footsteps of Marco Polo along one of the world’s oldest and most historic trade routes. This great caravan road linked the kings of Europe with the luxuries of Asia—most significantly, its silks and spices. It is preserved to a remarkable degree. Upon arrival at Almaty Airport, you will be met and transferred to the Intercontinental hotel, a luxury five-star property located opposite the Presidential Palace in Almaty’s Republic Square for a one-night stay. Tashkent is the capital city of Uzbekistan. We spend time touring this modern Soviet-style city, which was rebuilt following the devastating earthquake of 1966. Our tour of the city includes the Old Town, where traditional homes and religious buildings line the narrow streets. Here, in a small library, we’ll be privileged to see one of Islam’s most sacred relics – the world’s oldest Koran. This is followed by a visit to the Railway Museum and the Museum of Applied Arts. The mention of Samarkand, more than any other city, instantly conjures up evocative images of the Silk Road. Founded in the 6th century BC, Samarkand’s stunning architecture hints at its former status as one of the most important cities in Asia. It is particularly noted for its architectural remains from the 14th to the 17th century, when it flourished as the fabled capital of the Mongol empire of Timur and his successors. From Bukhara we transfer to the ancient and mainly unrestored remains of Merv. Once an important stopping point on the Silk Road, it claims to have briefly been the largest city in the world during the 12th century. The Golden Eagle makes a brief scheduled stop at Ichoguz, where we have the option to leave the train and make a short journey to Darvaza’s famous burning gas crater, a spectacular sight best seen at night. Located in the middle of the Kara Kum desert where the area is rich in natural gas, the 70 metre-wide crater is known by locals as the ‘Door to Hell’ and has been burning for over 40 years. A unique experience that is not to be missed. Today we enjoy a relaxing day on board as we travel across the vast expanse of the Kara Kum desert. As well as experiencing the unique landscape, you can take the opportunity to chat to fellow passengers and maybe take a Russian language lesson. Enjoy the train’s beautiful lounge car and take meals in the dining cars. Standing on the banks of the Volga, Stalingrad, as it was known in Soviet times, was the dramatic scene of one of the most important WWII battles. The Russians heroically turned back the Nazi advance here to alter the course of the war. We visit the poignantly sobering Mamayev Kurgan war memorial, followed by an informative museum visit. Today we arrive into Moscow, our final destination. Included in our time spent in Moscow is two nights at the outstanding, five-star Baltschug Kempinski hotel, overlooking the Moskva River with an unrivalled view of the Kremlin, Red Square and St. Basil’s Cathedral. Our touring program of Moscow principally takes us to the grandeur of the Kremlin – the spiritual, historical and political heart of Moscow – and to see the treasures of the Tsars in the Armoury Chamber. We also visit Red Square, an iconic symbol of Russia’s former military and political might with its eclectic mix of fascinating architecture, such as the ornate St Basil’s Cathedral’s magnificent onion-domed spires, the beautiful facade of the world famous GUM department store, constructed in Tsarist times, and the somber and evocative site of Lenin’s tomb. With our Freedom of Choice touring option you may instead wish to travel out of the city center to Sergiev Posad, home to one of the most beautiful monasteries in Russia and the historical and spiritual center of the Russian Orthodox Church or visit the famous State Tretyakov Gallery (National Museum of Fine Art). After breakfast in your hotel, you will be transferred to Moscow Airport for your onward flight. Three visas are required for this journey (for U.S. citizens); please allow six weeks for this process. Visa requirements vary depending on citizenship. Please inquire. Kremlin museums are closed on Thursdays; in this case, Kremlin museums tour occurs morning of departure day. Latest News: Click here for owner Owen Hardy’s blog on improvements on the Golden Eagle. Kipchak Mosque in Ashgabat, Turkmenistan. IRT Photo by Angela Walker. Golden Eagle attendant serves coffee to the cabin. IRT photo by Angela Walker. Uzbek women in the ancient city of Khiva. IRT Photo by Angela Walker. Russian girls marching in Volgograd. IRT Photo by Owen Hardy.